The long-awaited sequel to Volume 1, this new CD is a rockin' collection of baseball songs that are funny and catchy. Full band arrangements on five tracks. 1. Why Did You Go, Johnny Damon? Twenty-nine years after the release of “Baseball's Greatest Hits, Volume 1,” the long awaited sequel is finally here. “Baseball’s Greatest Hits, Volume 2” is a rockin’ collection of diamond delights that are funny, charming and musically intriguing. You’ll not only find yourself amused by the witty lyrics but also tapping your feet to some of the best music ever produced on an indie album. The CD includes a lyric booklet with classic ballparks etched into the background. Why Did You Go, Johnny, Damon? – All of New England was in a state of shock when this Red Sox hero defected to the Yankees. Not any more, though. Weekend Warrior – Dedicated to the once-a-week ballplayer, this tune features the searing electric slide guitar of Duke Levine (Aimee Mann, Mary Chapin Carpenter). Mendoza Line – The man, the myth and the .200 batting average. Listen carefully and you’ll learn a few things you never knew about Mario Mendoza. It’s the End of the Curse and We Know It – A parody of the similarly-titled R.E.M. hit, this song celebrates the Red Sox first World Series title in 86 years. It's safe to say that this is he only musicial piece ever written that contans the word "Leskanic." Doug Mientkiewicz – It’s a fun name to say, even more fun to sing. And in less than two minutes, you can learn to say, spell and sing Mientkiewicz. Blasted in the Bleachers (studio version) – How ’bout a good ol’ fashioned Fenway Park drinking song? This is a remake of the original live version, featuring fiddle, pedal steel and piano. “Baseball’s Greatest Hits, Volume 1” is believed to be the first album of original baseball songs by one artist. It was originally released in 1979 as a vinyl extended play record (a limited number of copies are still available in this format) and was remastered into a CD in 2001. In 2002, “Baseball's Greatest Hits, Volume 1” was accepted into the National Baseball Hall of Fame Archive. Howie Newman is back with, Baseball’s Greatest Hits Vol. 2, and knows what he sings about, having been a sportswriter for 18 years and covering 2 World Series. Style-wise the songs range from folk, blues, and rock, to country. Joining him are, Duke Levine- guitar (Mary Chapin Carpenter, Aimee Mann), Steve Mayone-guitar (Levon Helm, Kris Delmhorst), Jim Gambino- piano (Swinging Steaks), and Chris Anzalone- drums (Toni Lynn Washington, The Radio Kings). This is a nice fun release that’s a nice break from the usual and will bring a smile to your face if you’re a fan of baseball, and even a bigger one if you’re a Boston Red Sox’s fan. From the opening words of "Why Did You Go, Johnny Damon?" on Howie Newman’s latest album, Baseball's Greatest Hits, Vol. II, this Boston-based folk rocker, humorist, sports journalist and public relations maven shows you exactly why he belongs on this list [of indie rock artists with baseball on their mind]. It's his second album of songs entirely based on the National Pastime, and all of them are as clever, biting and original as the Damon song. Baseball’s Greatest Hits, Volume 2 is a classic contribution to American popular culture. Nothing lends itself to our national pastime more than the folk music genre, and no one exemplifies it more than the creative sound of Howie Newman. 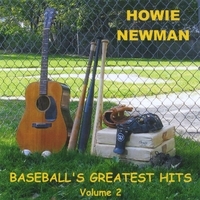 Howie Newman's "Baseball's Greatest Hits, Volume 2, is an awesome collection of songs. For the first time in 10 years I took Led Zeppelin out of my CD player and replaced it with Howie's disc. "Mendoza Line" is my new "Stairway to Heaven." “Mendoza Line” may be one of the greatest baseball songs ever written. What else can you say about an American rockabilly tune written about a shortstop from Mexico who once hit .198 for an entire season? You also absolutely must check out “It's The End Of The Curse and We Know It,” an R.E.M. spoof … about Boston Red Sox finally breaking "The Curse of the Bambino" with their 2004 World Series championship. Howie Newman is always entertaining, and for a Red Sox fan he's not a bad guy. Baseball fans in general will get a kick out of it, as will fans of country-tinged folk rock. This is definitely a worthwhile 20 minutes spent!